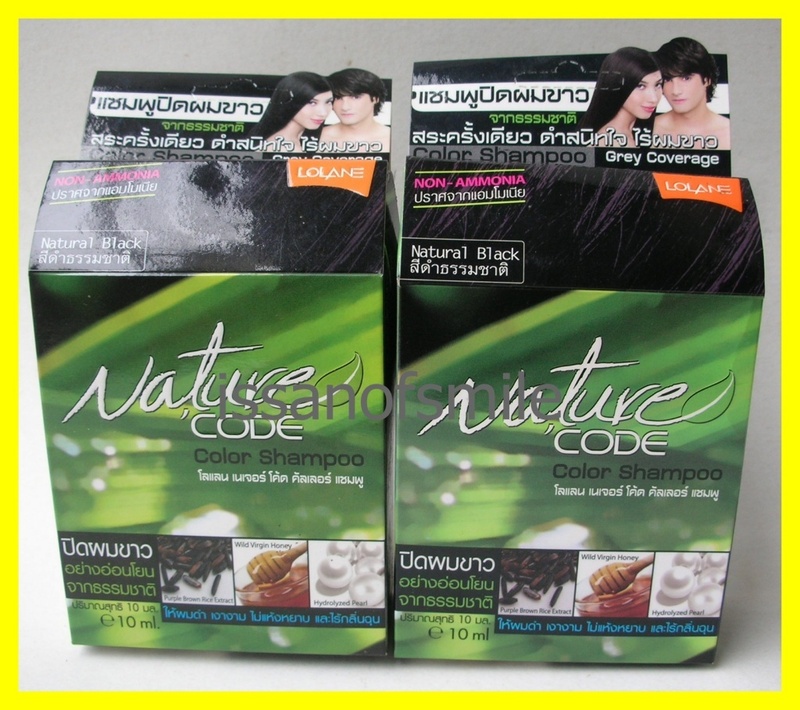 Lolane Nature Black Code Color Shampoo Grey Coverage Non Ammonia 2 Boxes Descriptions : Grey coverage shampoo decodes various benefits from nature. With no Ammonia helps enhance hair to be soft smooth without causing unpleasant smell. How to cover grey hair : 1. Pour Shampoo (1) into a bottle of Pearl milk (2) and shake well until combined. 2. Wear glove Apply shampoo to damp hair from grey hairs'roots first and thoroughly massage. 3. Leave for 5-15 minutes (The interval depends on hair conditions. 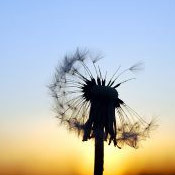 For exessively oily hair, coarse hair, undyed hair, it should be left least for 15 minutes) 4. Massage again. Rise off with water. ( No need to repeat any shampoo) 5. For the long-lasting color with soft smooth hair, it is suggested to use LOLANE Nature Hair Treatment for Nourishing Color Care everytime after shampoo. For the best result, your hair should be definitely damp. Quantity : 2 Boxes Content: A kit contains: 1. 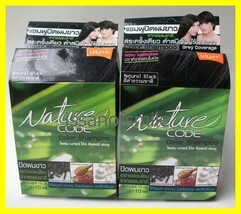 Color Shampoo(1) 10 ml. 1 sachet 2. Pearl Milk (2) 10ml. 1 bottle 3. A pair of plastic gloves Free! Lolane Natural Hair Treatment Condition: All of our products are genuine and brand new from leading department stores. We never sell expired or near expired products.Expiration date is between 6-12 months. Shipping : Your order will be shipped within 1-3 days. Please allow 2-3 weeks for international delivery. Feedback : We try our best to make your purchase as pleasant as possible. If you are happy with your purchase, please leave us a positive feedback. We will do the same for you. But if you are not satisfied with your purchase, please let us know before you leave us a negative feedback. We will try our best to fix any problems. Check out my other items! Be sure to add me to your favorites list! Thank you for looking!